Homemade ice cream is always fun and adding cookie pieces makes it extra special. Pour the milk into a heavy saucepan. Over medium heat bring the milk to a gentle simmer (approximately 175Â° F) or until it begins to bubble around the edges. Remove from the heat. Then, add the sugar and salt and stir the scalded milk until sugar and salt are completely dissolved. Add half and half, vanilla, and whipping cream and stir until well blended. Pour the mixture into a bowl and allow to cool to room temperature. Once it has cooled, cover with plastic wrap and allow it to age in the refrigerator for at least 4 hours (or up to 24 hours). This aging process will produce ice cream with more body and a smoother texture. 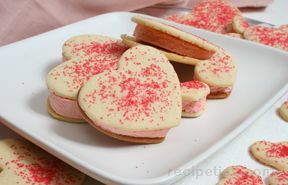 While the ice cream mixture is chilling in the refrigerator, break cookies into small bite size pieces. Place the pieces in a bowl or measuring cup and set aside until needed. After aging (chilling) the mixture, remove from the refrigerator and stir the mixture. The ice cream is now ready for the freezing process. Follow the ice cream maker's instruction manual on the freezing process. 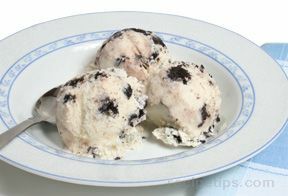 When the ice cream has thickened, but is still too soft to scoop, add the cookie pieces and stir until they are evenly distributed. 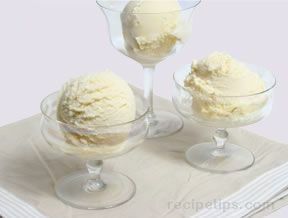 Or, add the cookie pieces and start the ice cream maker churning again to stir them into the ice cream. Some makers have an opening in the top that is used to add flavorings as the ice cream is churning. Once the pieces are mixed in, scrape the ice cream into another container with an airtight cover. Be sure to leave at least 1/2 inch head space for expansion. 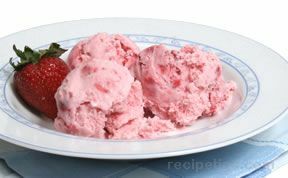 Place the ice cream in the freezer for several hours to harden before serving. "Do i whip the cream before adding it?" "Mmmmmm! My kids thought it was so cool to eat ice cream they helped make. They didn't like how long it took but learned it was well worth the wait! Thank you for a great recipe."